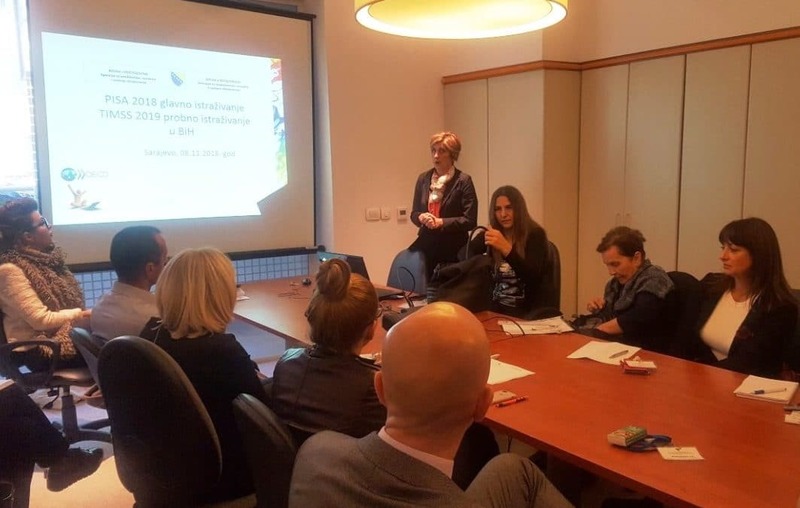 The meeting of the PISA 2018 and TIMSS 2019 coordinators, appointed by the ministries of education in Bosnia and Herzegovina and the Education Department of the Brcko District, was held on 8. 11. 2018 in the premises of the Agency regional unit in Sarajevo, in the presence of the Agency and OSCE representatives. A National Coordinator for PISA 2018 and TIMSS 2019 surveys informed the attendees on the completed activities related to the main PISA 2018 assessment and TIMSS 2019 field test in Bosnia and Herzegovina. Addressed were also recent preparations and upcoming activities related to the TIMSS 2019 main study. Also, presented was a sample of schools covered by the research to be taken by students, teachers and school directors. In addition, a media campaign entitled ‘Quality education for every child’ was presented with a focus on the international assessments and possibilities of using the obtained data. Noted was the established good cooperation should be maintained in the future. The participants had the opportunity to express their views, comments and suggestions and agreed were next joint activities for the TIMSS 2019 main study according to the prescribed standardized procedures.